The City and Borough of Juneau has passed a resolution naming the intersection of Front and Seward Streets “Heritage Square,” bolstering Sealaska Heritage Institute’s (SHI) effort to designate Juneau and the region the Northwest Coast art capital of the world. The resolution passed Monday and received no opposition from the assembly. 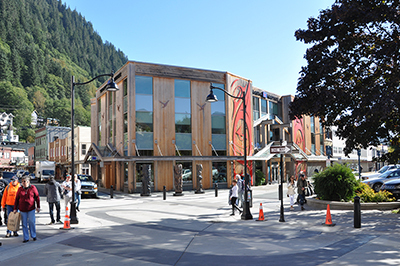 The resolution noted that SHI’s recent installation of three bronze posts at that corner continues the institute’s progress toward developing Juneau as the center of Pacific Northwest Coast arts. The resolution also said the site is appropriate and will honor the many economic, civic, and cultural contributions of all people in Juneau. “The intersection of Front and Seward Streets represents the symbolic center of Juneau’s cultural, historical and economic fabric, located near the Capitol, the Sealaska Corporation and Heritage Institute, City Hall, the downtown business district and the cruise ship docks and is on Juneau’s original shoreline,” according to the resolution. The city plans to include the site on city maps and other materials and provide signage to mark the location. SHI President Rosita Worl first floated the idea of a Heritage Square at the intersection three weeks ago at the unveiling of the bronze posts. “I’m so thankful to Mayor Ken Koelsch and the assembly for running with this idea and making it happen so quickly. It is gratifying to have such support from the city in our quest to designate this area the Northwest Coast art capital,” Worl said. Caption: Photo of Heritage Square by Amy Fletcher, courtesy of Sealaska Heritage Institute.